The Word of God puts the evilness of philosophy to shame. Remember there’s a way that seems right that leads to death. 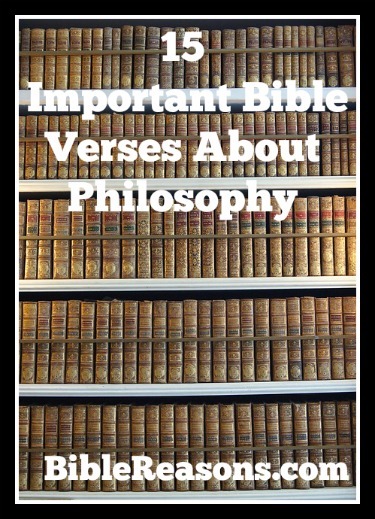 Should Christians study philosophy? We must be careful that we are not deceived by it because many have been, but I believe it would be useful for apologetics to combat false teachings and defend the faith. 1. Colossians 2:7-8 Let your roots grow down into him, and let your lives be built on him. Then your faith will grow strong in the truth you were taught, and you will overflow with thankfulness. Don’t let anyone capture you with empty philosophies and high-sounding nonsense that come from human thinking and from the spiritual powers of this world, rather than from Christ. 2. 1 Timothy 6:20-21 Timothy, guard what has been entrusted to you. Avoid the pointless discussions and contradictions of what is falsely called knowledge. Although some claim to have it, they have abandoned the faith. May grace be with all of you! 3. James 3:15 Such “wisdom” does not come down from heaven but is earthly, unspiritual, demonic. 4. 1 Corinthians 2:13 When we tell you these things, we do not use words that come from human wisdom. Instead, we speak words given to us by the Spirit, using the Spirit’s words to explain spiritual truths. God will shame the world. 7. 1 Corinthians 1:27 Instead, God chose things the world considers foolish in order to shame those who think they are wise. And he chose things that are powerless to shame those who are powerful. 8. 1 Corinthians 1:21 For after that in the wisdom of God the world by wisdom knew not God, it pleased God by the foolishness of preaching to save them that believe. 9. 1 Corinthians 1:25 For the foolishness of God is wiser than human wisdom, and the weakness of God is stronger than human strength. 10. 1 Corinthians 1:20 Where is the one who is wise? Where is the scribe? Where is the debater of this age? Has not God made foolish the wisdom of the world? 11. Jeremiah 8:9 The wise will be put to shame; they will be dismayed and trapped. Since they have rejected the word of the LORD, what kind of wisdom do they have? 12. 1 Corinthians 2:6 We do, however, speak a message of wisdom among the mature, but not the wisdom of this age or of the rulers of this age, who are coming to nothing. 13. Titus 3:9-10 But avoid foolish controversies, genealogies, quarrels, and fights about the law, because they are useless and empty. Reject a divisive person after one or two warnings. 14. Psalm 49:12-13 People, despite their wealth, do not endure; they are like the beasts that perish. This is the fate of those who trust in themselves, and of their followers, who approve their sayings. 15. 1 John 4:1 Beloved, do not believe every spirit, but test the spirits to see whether they are from God, for many false prophets have gone out into the world.